Follow these steps to program debugging using the µVision Debugger and the ULINK USB-JTAG Adapter. Detailed information can be found in the µVision User's Guide in the Debugging topic. Connect the ULINK to the JTAG connector of the MCBXC167 Board. Note that the red cable marks pin 1 of the JTAG-connector. Select the Use: radio button and then OCDS Driver for XC16x in the drop-down list to choose the ULINK USB-JTAG Adapter as the debugging tool. Check the Load Application at Startup and the Run to main() options to load your application and execute code up to the beginning of your main() function when the debugger starts. Click the Settings button to open the OCDS Driver for XC16x dialog. 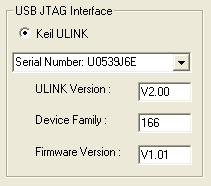 Make sure your ULINK adapter is connected, then select the Keil ULINK button in the USB JTAG Interface group to direct the debugger to use the ULINK device for debugging. When selected, the Serial Number, Device Family, and Firmware Version information for the ULINK adapter displays.